This is undoubtedly one of the best books on Christian fundamentalism in recent times, but it is not a book which will convince the average fundamentalist. His or her choice has been made, ratified, and solidified in such a way as to preclude any openness to a position other than the one in conformity with the fundamentalist tradition. 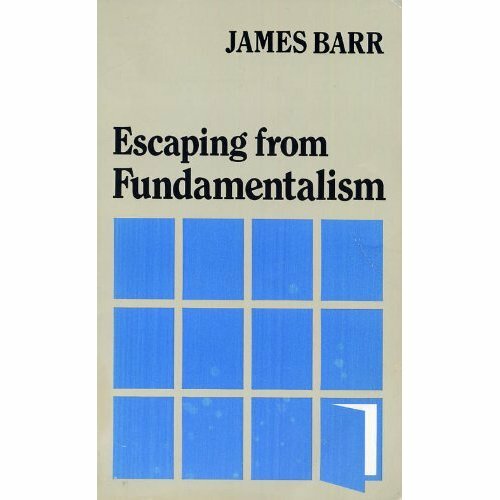 Escaping from Fundamentalism uncovers the intellectual basis of Christian fundamentalism with the knowledge and expertise of one of the world’s top Biblical scholars. Though Barr is a committed Christian he outlines alternative ways of interpreting the Bible, in conformity with the actual nature, contents and text of the Scripture. Fundamentalist Christians are in the forefront of attacks on Islam and Muslims in the world today. We at MDI have refuted and exposed their lies about Islam in our many debates and lectures, and God willing, we will continue to do so. This book, in my opinion, is indispensable for Muslims (and Christians!) in forming an academically sound understanding of the Christianity we most often encounter. James Barr FBA (20 March 1924 – 14 October 2006) was a Scottish Old Testament scholar. Born in Glasgow, Scotland, Barr was ordained to the ministry of the Church of Scotland in 1951. He held professorships in New College, Edinburgh in the University of Edinburgh, Manchester, and at Vanderbilt University in the United States of America. He was Oriel Professor of the Interpretation of Holy Scripture at Oxford from 1976 to 1978 and Regius Professor of Hebrew at Oxford from 1978 to 1989. He was also an outspoken critic of conservative evangelicalism, which he attacked in his 1977 book Fundamentalism. In particular he criticized evangelical scholars such as Bernard Ramm and J. I. Packer for the doctrine of scriptural inerrancy, the teaching that the Bible is without error. However, he also had high praise for evangelicals thought by him to deserve to be treated as serious scholars, such as F. F. Bruce and Donald Guthrie. Barr served as President of the Society for Old Testament Study (1973) and of the British Association for Jewish Studies (1978), and was elected a Fellow of the American Academy of Arts and Sciences in 1993. He died in Claremont, California aged 82.